For those out for a pleasant afternoon stroll to the experienced trekker, Mammoth and the surrounding area is one of the most scenic places on earth. You could spend an entire lifetime and not see all there is to see in the beautiful Eastern High Sierras. 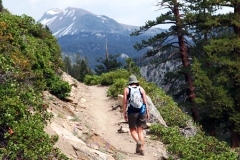 For short hour walks to a pristine lake to daylong trips into the remote backcountry to longer, spectacular hikes along the John Muir Trail, you'll experience incomparable beauty, challenge and create lifelong memories! Pick up area trail maps at the Mammoth Lakes/Forest Service Visitor's Center on Highway 203 as you enter town. Also check out information at various sporting goods stores throughout Mammoth Lakes. We carry several handouts right in our Mammoth Sierra Reservations office that you may pick up on arrival or ask one of our knowledgeable agents when you make your Online Reservations.